Japanese space food for the International Space Station. Japanesespace food will soon be available on the International Space Station (ISS). 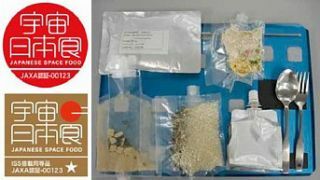 TheJapan Aerospace Exploration Agency (JAXA) has certified 29 Japanese foodproducts for use in space. Astronauts and cosmonautswill soon enjoy such Japanese take-out standards as ramen, curry, onigiri (riceballs) and green tea (see photo).What took them so long? The ISS has tough standardsfor food in space; it must be able to survive the changes in temperature andpressure on the ride up, and must be able to survive a year in storage atzero-g. Careful food serviceengineering is also required; for example, the ramen has a thick broth and thenoodles are clumped together in bite-sized pieces. Food products are alsopacked in special containers, and can have preparation times no longer than anhour. And fordessert, a little bit of Kuroame (brown sugar candy); hopefully, theInternational Space Station also has stringent standards regarding brushingafter meals. The food was three hundred thousand years old, I suppose. Ididn't know, and the machines that served it to me didn't care, for they made thingssynthetically, you see, and perfectly. (Read more about Campbell's synthetic fooddispenser). (Read more about Heinlein's microwavable foodrations). NASA has also given a greatdeal of thought about how to provide food to astronauts on long voyages; see RoboticTomato Harvester Ready For Space for details. The Chinese space program isalso interested in the effects of space travel on food production; see Chinese'Seed Satellite'. US astronauts, however, are going to want beef; take alook at CulturedMeat Straight From The Vat.